As a part of the urinary tract system, your kidneys are responsible for ridding your body of excess fluids and waste. Like all organs, your kidneys are are susceptible to cancer. According to the National Kidney Foundation, there are two main types of kidney cancer: transitional and renal cell cancer. Adjusting your diet to exclude bad kidney foods can play an important role in treating your kidney cancer. According to the "Johns Hopkins Patients' Guide to Kidney Cancer" by Dr. Janet R. Walczak, kidney cancer patients should avoid foods that contain high amounts of the oxalate compound. This chemical can become lodged in your kidneys, form stones and cause complications that can affect your kidney cancer treatment. These chemicals are commonly found in dark leafy green vegetables, beets, rhubarb, spinach, tea, wheat bran, tofu and nuts. Although protein is beneficial for maintaining muscle strength and building cells, in kidney cancer patients it can worsen your condition. When you consume protein-rich foods, the chemical compound uric acid can accumulate in your body as a toxin and cause conditions that may complicate kidney cancer. This can cause complications such as heart disorders, joint pain and muscle weakness. A 2011 renal nutrition update in "Renal and Urology News," animal proteins are more harmful than plant protein if you suffer from kidney disease. Animal proteins can be found in chicken, pork, beef, milk, creams, cheese, eggs and other forms of meat. Plant protein includes beans, nuts, seeds and whole grains. Excess potassium in your body can affect your kidney cancer condition. Potassium regulates your muscle and heartbeat functions. As a result, an overabundance of potassium can cause muscle weakness and cardiovascular problems that can complicate kidney cancer, notes Dr. Eric P. Cohen in the "Cancer and the Kidney." High potassium foods include avocado, chocolate, granola, dates, figs, bran, squash, apricots, peanut butter, honeydew, broccoli, molasses, milk and bananas, as listed by the National Kidney Foundation. If you have kidney cancer or an associated illness, consuming foods with phosphorous may complicate your condition. When you eat phosphorus-rich foods, your body is unable to properly excrete the chemical, reports the National Kidney Foundation. This can lead to weakness, joint pain and unnecessary stress on your kidneys. 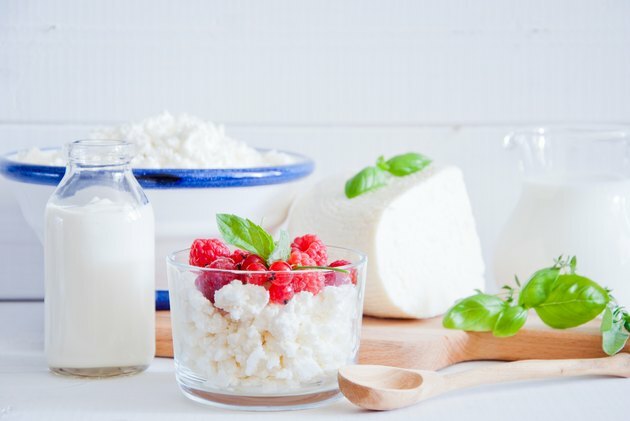 Phosphorus-rich foods include liver, beans, chocolates, yogurt, milk and cheese.